Shadows of the Damned - hori-nakhtmins Webseite! 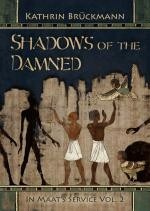 Hori and Nakhtmin have barely adjusted to their new duties as the pharaoh's palace physicians when Hori is summoned to the secret embalming compound. A heart has been found there, which doesn't belong to any of the corpses; a heinous crime must have been committed, which robs the dead of any chance for an afterlife. While clueless Nakhtmin begrudges his friend for simply disappearing and makes new acquaintances, Hori finds out far more than he bargained for and unwittingly puts his own life on the line. The surplus heart isn't the only thing off kilter at the weryt: the very secrets of the necropolis are in danger!